Next Wednesday night, I will be hitting the stage with Brisbane’s sonic mistress, Pascalle Burton as part of the inaugural, FreeVerse event, emceed by the wild and wonderful Ghostboy. Pascalle and I will be trading words, letting our poems rub up against each other so that they create their own spontaneous dialogue! And we both have a little surprise in store for the audience in the form of a cover version. Yes, Pascalle has given one of my poems a little sonic makeover and I have reworked one of her poems in a way that may just free the inner performer in the most unusual way… Intrigued? 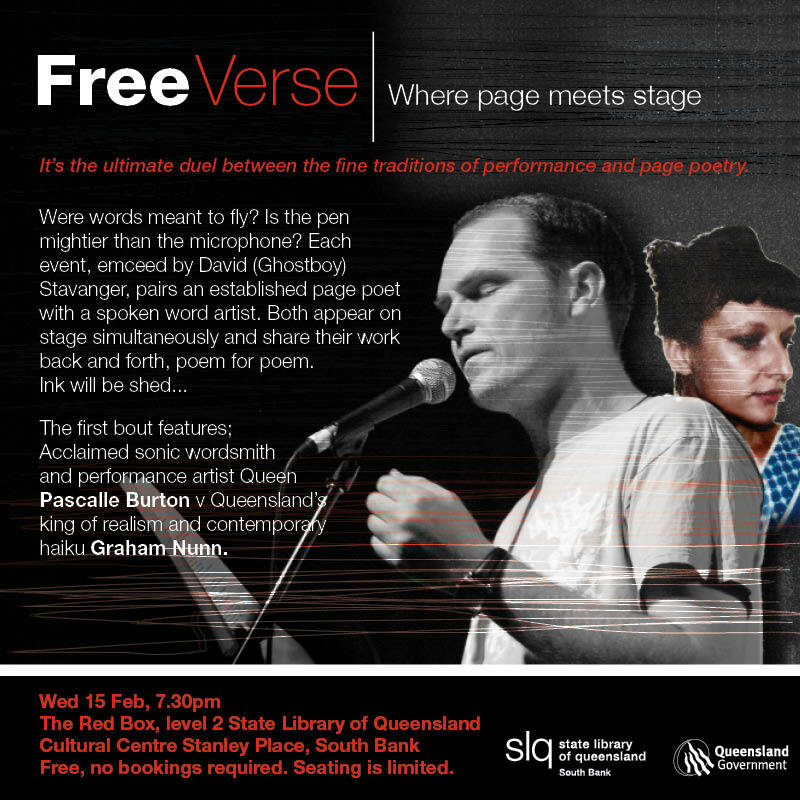 Well, I look forward to seeing you all next Wednesday night, February 15 as we light up the Red Box at State Library. 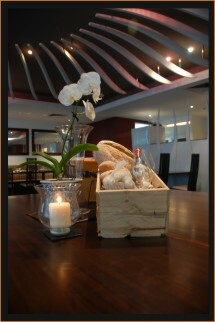 The Back Room keeps the QPF buzz going when it lights up Confit Bistro (4/9 Doggett Street, Fortitude Valley) tomorrow night (Wednesday August 31). This is an event not-to-be-missed as it will feature the launch of two sparkling new poetry collections, The Curse Words by Samuel Wagan Watson and Career by Liam Ferney. The Curse Words is the second chapbook from award winning poet, Samuel Wagan Watson for Vagabond Press; a mixture of prose-poems and textual blues-riffs. The Curse Words frames some of Samuel’s ‘muses’ and abuses of verse. This chapbook inspired a well-received show at the recent Adelaide Cabaret Festival by award-winning chanteuse, Leah Flanagan and will premier at the 2012 Sydney Festival. Both collections will be launched by acclaimed Brisbane poet, Brett Dionysius. Sheish Money & I will also be on deck to fire things up, so get your poetry shoes shined… doors open at 6pm with the live action staring at 6:30pm. After a couple of days at home, I am starting to feel back on the Brisbane clock, but I am sure I will feel even more at home when I get behind the mic with the mighty Sheish Money at The Back Room’s Mid-Winter Session this coming Wednesday. Let me just say… the line up crackles! Lighting up The Back Room at Confit Bistro (4/9 Dogget St, Fortitude Valley) this Wednesday night (July 27) alongside Sheish and I will be the twisted tunes and bent words of Ghostboy & Skye Staniford, co-editor of the legendary Going Down Swinging and all round literary over-achiever, Geoff Lemon, performance ensemble Zen Zen Zo and an exhibition of new work by fashion illustrator, Oliver Searle. the walls of the place just might implode. Make sure you are there to find out! If you can make it along, drop a comment on the post and let me know numbers or shoot me an email at geenunn(at)yahoo(dot)com(dot)au and I will look after the rest. Entry is free and the doors open at 6pm with the live sounds beginning to rumble from 6:30pm. Well, I am heading off for the week to walk the city from my mind… and when I return, SpeedPoets will be kicking up a storm. Brisbane’s longest running poetry event, SpeedPoets keeps fanning the flames of poetry at InSpire Gallery Bar (71 Vulture St, West End). October will feature spoken word dynamo and multiple Slam winner, Robin ‘Archie’ Archbold. The last time I saw Archie perform was at the Goolwa Poetry Festival where he popped a button in someone’s drink. It was very special! There will also be the regular live sounds from Sheish Money, free zines, raffles/giveaways and the hottest Poetry Open Mic Section in town. So be sure to pack a poem or two in your pocket and get yourself heard! Avid Reader’s (193 Boundary St West End) Poetry Month celebrations continue tomorrow night (Thursday September 16) with readings from Tessa Leon, Jeremy Thompson, Bruce Dorlova and 2010 Arts QLD Poet-in-Residence Emily XYZ. This will be Emily’s final reading in Australia in 2010, so make sure you are their to get your last hit. for a moment / is it an error? Avid Reader (193 Boundary St West End) have declared September, ‘Poetry Month’ and to celebrate they are putting on some mighty fine events. The first of these is a discussion / reading taking place this Thursday night. To pick at the seams of the question, ‘Why Poetry?’ they have assembled Bronwyn Lea, Nathan Shepherdson, Ross Clark, Arts QLD Poet-in-Residence Emily XYZ and this Lost Shark. For me, what Bukowski is getting at here is poetry’s ability to embrace and elevate all that makes us human. When you hear it, you should be able to see, as if in a flash of lightning, the words crystallise, and if you are open to it, the poem will contain more than images. Poetry invites us to cast off habit and reconsider life with new eyes and at its best, as Emily Dickinson put it, can take the top off your head. I strongly believe that enjoying poetry is as natural as drawing breath. As a boy I spent many summers sitting beside my father watching Australia’s great fast bowler, Dennis Lillee tear through various batting lineups. Each time the stumps would buckle or Lillee would throw himself into his trademark appeal, shouting ‘Howzat’, my father would look over at my brother and I and say, ‘that was poetry’. Of course my father did not mean that it was literally poetry, he was simply pointing out that Lillee’s bowling had the qualities one normally expects of poetry – grace, surprise, beauty, rhythm. My father was not much of a poetry reader, but he, like all of us, had an idea of what poetry is and should be. We know this because poetry is not firstly in the words; it is there to be discovered in the current of the river, the rush of the street, the strange angles of a spider’s web, a home cooked meal. Our senses are bombarded with literally thousands of stimulants on a daily basis… poetry is about stripping this back and getting in touch with the things that really matter; finding the truth in the everyday. When I tell people that I write poetry, a common response is, ‘I don’t really get it’, but the truth is, that is just a reflection of society’s needless mystification of the art. A poem is not an obscure code or linguistic puzzle, if it works, it will speak to you. But remember, it’s a matter of chemistry. Not every song you hear or film you watch will speak to you, likewise, every poem you encounter will not hit the mark, but don’t let that deter you, there is an infinite number of voices and styles waiting to be discovered and when a poem hits, it will cast its spell and make the mind sing; it will engage your imagination and draw you into its universe. As there are a myriad voices writing poetry today, I thought I would ask a handful of the poets participating in the Avid Reader Poetry Month festivities to get their thoughts. The one thing each of these responses has in common is the passion and belief in which they are delivered. That is the power of poetry… when it hits, you are never again the same. So why not get along to one of the many poetry events happening in this fine city of ours or to your local independent book store and embark on your own quest to answer this question. The journey could just be life changing.